I just love this little turtle. I cut him out using Walk In My Garden cartridge. 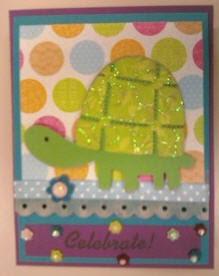 I then ran his shell through the cuttlebug using the swirl embossing folder then added stickles to his shell. Thanks for looking!